Set of supplementary Programmable Cards for Savvi Softcards. The Softcards are used to personalize the Savvi programmable test card before executing each individual test case of a test plan. Once a programmable test card has been personalised with the selected Softcard it behaves like any FIME physical test card. 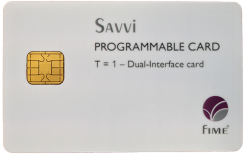 The Savvi Programmable Card Pack 1 contains a set of 5 supplementary programmable cards. Depending on the selected Softcard, a T=0 or T=1 programmable card has to be used. Savvi prompts to the user the programmable card type to be used.